The concept of the roguelike has, shall we say, saturated the market for the last couple of years now. Starting around 2011, developers big and small clamored to incorporate the major pillars of the genre into their games, varying in both extent and effect. For many, that clamoring amounted to some form of procedural generation, but a few developers found themselves struck by the concept itself: the stress of a continuous, independent “run”, the obtuse flow of information, the seemingly never-ending well of secrets. When Nuclear Throne first hit Steam’s Early Access program in 2013, one could’ve easily dismissed it as little more than an attempt by Vlambeer to capitalize on industry demand. Over the course of the next couple years, though, it became increasingly clear that the developers weren’t simply interested in co-opting roguelike “buzzwords.” Instead, Vlambeer built upon those concepts to create something both very familiar and decidedly unique. A solid foundation is all well and good, but it rarely matters to the folks above ground. More often than not, they’re interested in what they can see and interact with: in this case, the gameplay. 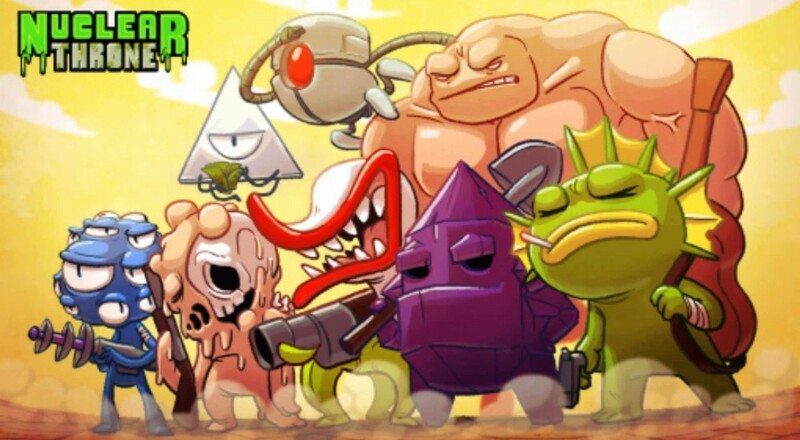 Were Nuclear Throne’s action not intense, stressful, and rewarding, those roguelike underpinnings would be for naught. Thankfully, the game feels exactly how a twin-stick shooter/roguelike should, melding the genres seamlessly. The controls are both simple (not counting the joysticks, it utilizes a total of five buttons) and tight, so while you might be up against overwhelming odds at times, each death feels like a direct consequence of your inadequacy. Similarly, the objective is quite clear. Each randomly generated level serves as one step on the path to the enigmatic “Nuclear Throne” and contains a collection of folks who aren’t too keen on letting would-be royalty anywhere near it. Naturally, you just happen to have your heart set on the whole “King of the Wasteland” thing, meaning that twin-stick hijinx must inevitably ensue. Along the way, you’ll collect a number of weapons, mutations, and other such collectibles to assist you in your journey. The game offers enough substantial variety that, while you aren’t necessarily tripping over brand new items every run, you never quite get the feeling that you’ve seen it all. Even during the most innocuous of runs, you’ll find yourself checking the next container, hoping that it holds a surprise. The roster of characters injects a good dose of both mystery and variability as well, with each character offering stark changes in playstyle. You’ll start with just Fish and Crystal, who both center around damage avoidance and changing the way the game interacts with you. Soon enough, though, the “heroes” at your disposal will dramatically change the way you interact with levels and the enemies within them. Page created in 0.3329 seconds.